Yellow Hala scissor lamp made at the Dutch company Hala in the 60s. This vintage wall lamp can be pulled out from 16 – 70 cm and is adjustable in all directions. 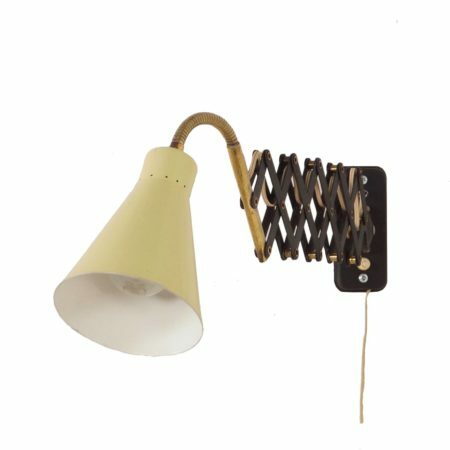 Considering its age this vintage wall lamp is still in good condition. Some traces of use and a small dent in the shade. The wiring has been checked. Material: iron. Measurements: h x w x d = 38 x 12,5 x 26-75 cm. The diameter of the shade is 12,5 cm.